Product prices and availability are accurate as of 2019-04-16 19:09:17 UTC and are subject to change. Any price and availability information displayed on http://www.amazon.com/ at the time of purchase will apply to the purchase of this product. The full Moroccanoil experience in TSA-approved travel-ready sizes. Travel Essentials: Repair Edition contains Moisture Repair products for normal to weakened, damaged hair. 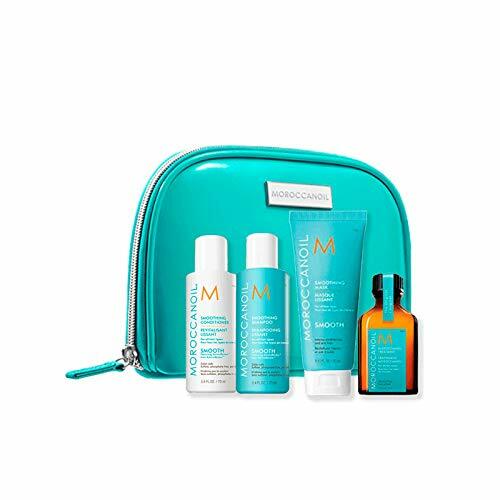 This collection is infused with protein to restructure the hair shaft for hair that is healthy and strong, and includes our signature Moroccanoil Treatment. Moroccanoil Treatment (.85 FL.OZ. / 25 ml) - an essential foundation for hairstyling that can be used as a conditioning, styling and finishing tool. Rich in argan oil and reparative proteins. Moisture Repair Shampoo (2.4 FL.OZ. / 70 ml) - gently cleanses while infusing each strand with reparative nutrients, leaving hair strong and manageable. Moisture Repair Conditioner (2.4 FL.OZ. / 70 ml) - gently detangles and softens hair while restoring elasticity and manageability with reconstructive keratin and fatty acids. Restorative Hydrating Mask (2.53 FL.OZ. / 75 ml) - For hair in need of immediate repair. A 5-7-minute revitalizing treatment that reconstructs and infuses protein back into strands that have been damaged by chemical treatments or heat styling. Its high-performance, deeply restorative formula is rich in argan oil, shea butter and reparative proteins to nourish, rebuild strength and restore hair's elasticity.